If the Holiday Inn Shanghai Pudong Kangqiao’s swimming pool is to be believed, people aren’t content with lounging on inflatable creatures in their backyard pool anymore. They want a truly unique — and dizzying — experience. 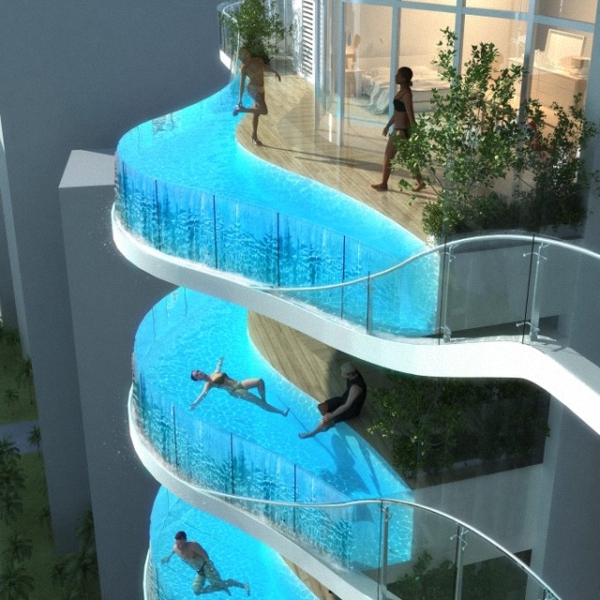 We spotted the 24-story high indoor pool on Geekologie, but the hotel isn’t alone in this gravity-defying trend. These “hanging” pools allow swimmers to soak in the world around them, and they’re particularly handy for architects that want to provide swim-friendly amenities for clients short on space — especially in big cities. Take a dip in the Holiday Inn Shanghai Pudong Kangqiao’s swimming pool past the break , and see other amazing, floating pools that require an adventurous spirit.